Here at Ironmongery Experts we have a wide range of high-quality Casement Stays. These designs are the perfect way to provide optimum control over sash windows, since you can adjust how far open you want your windows to be open. This is a practical method of regulating the amount of exposure to fresh air according to certain weather conditions. For a solid and permanent method of closing sash windows, we stock a selection of Casement Fasteners. This will ensure that windows will remain closed and prevent exposure to cool air during the winter season. Sash windows can sometimes prove to be hazardous when they have been placed on the higher levels of buildings. This will require a method that allows windows to only be opened at a certain distance. Jackloc Window Restrictors will ensure that windows situated at dangerous heights won’t open far enough for people to fall through. If you are looking for a traditional vibe for you household, then we have some compelling Sash Lifts & Handles, made from a variety of strong and durable materials like chrome and brass. Having a handle in place for sash windows will make the process of pushing and pulling a far more methodical process. Sash Fasteners are another simple and effective way to ensure sash windows have been closed with optimum levels of precision and solidity. 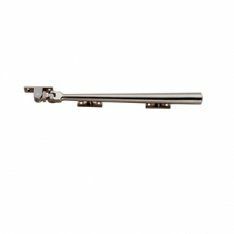 We have both screw and quadrant arm designs made from either brass or satin chrome. Any sash windows that operate with a sliding mechanism will require a Sash Pulley. These products are mostly suited to windows that use a rise and fall system. Our sash pulleys come with a carry cord to counter balance any sash weight. We also have the 19mm Roller Sash Stop which can be found on our Sash Stops page. This design is a solid brass socket screw with a hex fix fixing and has been manufactured by Zoo hardware. Another way too easily maintain balance for sash windows is installing a Sash Cord. They will make the process of pushing and pulling sash windows far smoother and more effective. Weight distribution is crucial for sash windows, which is why you should always consider installing the necessary amount of Sash Weights in accordance with the size of your window. Sometimes sash windows are out of reach and will require a mechanism in place so people are able to operate them safely. If you put a Fan Light Catch in place, you will be able to hook a long pole into the catch to open and close windows that are situated at a high level. Finally, we have a selection of Fanlight Stays which allows you to set a safe distance that your window should always be opened to. We have a variety of finishes that have all been manufactured by the Carlisle Brothers.